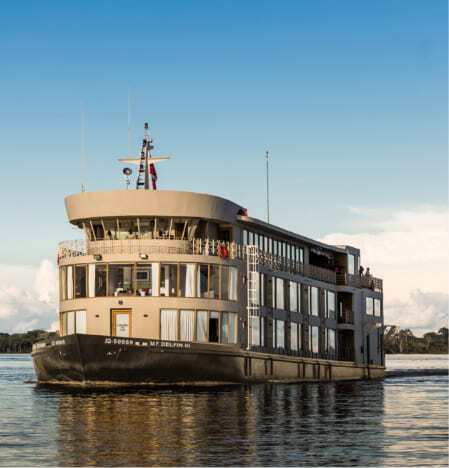 An Amazon riverboat is the ideal means of transportation for traveling in this exotic part of the world and enjoying the precious Amazon landscape, exotic native communities and characteristic wildlife of the Amazon. Discover the immensity of land that stands out for its unique beauty and diversity with our Amazon riverboat. 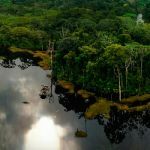 Pacaya Samiria is the second largest national reserve in Peru and is among the most protected biodiversity areas in the Amazon. Known also as the “Mirror Forest”, it is one of the best places for lovers of nature, wildlife, adventure, and Amazon landscape. No other destination in Peru offers the kind of unbarred access to some of Earth’s most exotic creatures and plants, like manatees, black caimans, pink dolphins, monkeys, piranhas, and even the fearsome anaconda! Just imagine yourself in an Amazon riverboat admiring the beautiful Amazon landscape and searching for the cackling macaws and sloths slowly climbing up the trees. Or swimming in a mirror-like lagoon and being greeted by rare pink dolphins. These and much more exciting adventures are waiting for you in our Amazon riverboat expedition. 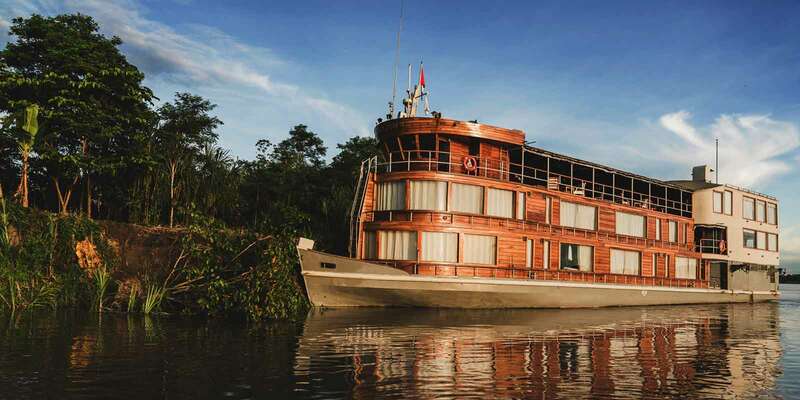 Delfin Amazon Cruises matches your destination, itinerary, and travel dreams in Amazon South America. 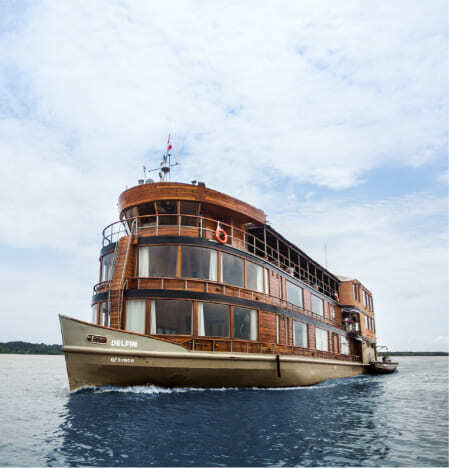 All of our itineraries have been carefully crafted to showcase the best Amazon landscape, flora and fauna that Pacaya Samiria National Reserve has to boast, along with offering ideal adventure excursions for travelers to further discover the secrets of the Amazon South America in our Amazon riverboat. 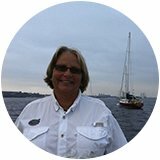 Tailor-made charters allow us to personalize your Amazon riverboat travel. 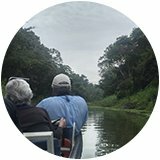 In addition to our regular itineraries, we can create a unique, fully custom-designed program just for you and your loved ones in Amazon South America. 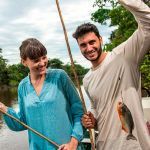 Birdwatching, kayaking, professional fishing, swimming with dolphins, deep exploration of jungle trails, and visit local communities are just some examples of specialized daily Amazon riverboat excursions we can arrange for your specific group’s interests, skills, and sense of adventure. Amazon South America is a true paradise for birdwatching: it harbors over 1500 species of birds, 20% of the total number of species in the world! 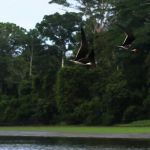 In this exotic and diverse region, you will embark on expeditions set out early in the morning on an Amazon riverboat to search the Amazon landscape for endless varieties of birds: migratory species, unique birds that cannot be found anywhere else, and those that mark the life cycle in the jungle. 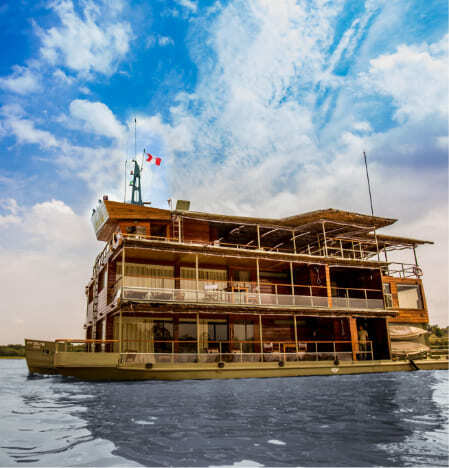 Picture yourself walking among the ear-deafening noise of hundreds of parrots and macaws, an unforgettable cacophonic experience as you explore the Amazon landscape or navigate across the river in an Amazon riverboat. Imagine having a close encounter with a beautiful male toucan or seeing the colorful macaws as they soar above the trees. This and much more awaits you in our Amazon riverboat expedition. As part of your Amazon riverboat expedition, you will visit the Rescue & Rehabilitation Center of River Mammals (ACOBIA), where you will have the chance to feed manatees and learn why they are on the endangered species list. Amazon South America river manatees are unique and docile creatures, which is why so many people have taken to adopting them illegally as pets. 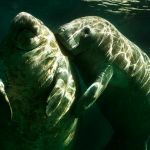 The ACOBIA foundation has dedicated to saving and rehabilitating rescued manatees from various communities and markets of Amazon South America. Volunteers also hold regular sessions to educate local citizens and schoolchildren to care and protecting them from abuse. On your Amazon riverboat expedition, you will learn about these amazing creatures also meet other animals rescued from captures, such as monkeys, river otters, and caimans. Delfin has made it the highest priority for practicing social responsibility by giving back to the communities of Amazon South America as much as the local people have enriched the travelers’ experiences. On our Amazon riverboat, handmade, custom-designed artisanal wares made by the village women vibrantly enhance every suite and dining room on board, which you can purchase directly in our Amazon riverboat or in the visit to the villages. 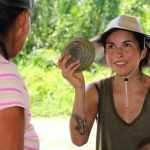 In the river communities, you will be presented with a variety of beautiful palm fiber crafts, wood, and seeds that we are sure will attract your eyes. 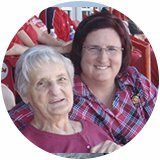 Purchasing them will help the family budgets, and you can also support them by bringing clothes, school supplies, toys, or healthful snacks. Visits to these communities bring our travelers together with the local people, allowing for cultural exchange at both ends.